The Cab Grid booking form requires customers enter a date and time for their journey start and a return date and time if necessary. 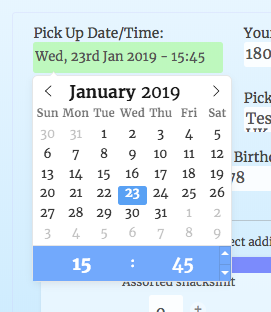 This is enabled through a date-time picker which is displayed when the custom clicks the pick-up date or return date fields. Likewise, the time format can also be switched between 12 and 24-hour formats in either the _settings.php file (or Defaults Add-on) in v5+, or the cab-grid-pro.js file in v4. It’s worth noting that, in general, Cab Grid will attempt to use formatting defined by WordPress under Settings > General > Date Format and Time Format. The following tables give details of the token (character) substitutions that can be used to display the date and time to the customer. If token characters are required within the date they must be escaped. Prefixing characters with two backslashes: \\ means the character will not bee interpreted/converted to a date part.